Badal and party knows how to remain in power by pleasing the Hindutava forces. He fully knows that RSS is opposed to development of Amritsar and thus he announces projects and then cancels them. Here are some news items to show this. Launched amid much fanfare by Deputy Chief Minister Sukhbir Badal ahead of the 2012 Assembly elections, the Punjab Government’s ambitious Personal Rapid Transport System (PRTS) project seems virtually shelved now with the lone bidder pulling out of it. The project would have seen magnetic pods running on an elevated guideway in Amritsar on the lines of Heathrow Airport in London. Sources said the bidder — ULTra Fairwood Pte Ltd — withdrew from the project as the state government wished to re-negotiate the deal, but the firm felt that it would have made the project financially unviable for it. Officials of the Punjab Infrastructure Development Board (PIDB) and the Punjab Municipal Infrastructure Development Company (PMIDC) revealed that the project had been shelved, but they were reluctant to say this on record. “We have not received any written communication in this regard. There has been no word about it for quite long. It must have been dropped,” said an official, requesting anonymity. The government invited bids for the PRTS twice and both the times it was bagged by ULTra Fairwood Pte Ltd. The PRTS project was supposed to cost Rs 198 crore on BOT (build, operate, transfer) basis. Two routes were also planned. The first was from the railway station to the Golden Temple and the second from the bus stand to the Golden Temple. A total of 200 magnetic pods were to run in the holy city which would have facilitated 50,000 to 75,000 passengers daily. The tentative fare would have been Rs 30 to 32 from the railway station to the Golden Temple and Rs 20 to 25 from the bus stand to the Golden Temple. Launched apparently with an eye on the 2012 Assembly elections, the project never took off. Initially, it was the traders who came out against the project, fearing that it would take a toll on their business as commuters would embark on magnetic pods head straight to the Golden Temple from the bus stand and the railway station. The Hall Bazaar Traders’ Association even downed their shutters to protest against the move. Later, The Tribune highlighted the heritage lovers’ apprehension about the PRTS eclipsing the view of the holy city’s significant landmarks such as the Golden Temple, Town Hall, Jallianwalla Bagh and Hall Gate, besides adversely affecting the heritage character of the walled city. Subsequently, the government changed the route plan from the railway station to the Golden Temple. The ULTra (Urban Light Transport) PRT System is a four to six-seater driverless, battery-powered, laser-guided vehicle with a central control system known as magnetic pod that uses rubber wheels running on an elevated guideway. The PRT is like a personal taxi which is demand responsive to a commuter, which means it can facilitate on demand, non-stop journey within the track network with operational flexibility. The other project hanging fire in the holy city include food street, modern sports complex and CCTV surveillance. The foundation stone of the Sports Complex was laid on November 12, 2011, but the work is yet to begin. The work on the installation of CCTV cameras has also been put on backburner. The food street was supposed to come up on the premises of Company Bagh, but the ASI shot down the move. The state government's ambitious Personal Rapid Transport System (PRTS) appears to have been put on the back burner as Deputy Chief Minister Sukhbir Badal stated that the only company that had come forward to execute the project had doubtful credibility. Besides, the government seems to be in no mood to antagonise traders and other sections which are up in arms against the project ahead of the Lok Sabha poll. The Deputy Chief Minister had laid the foundation stone of the PRTS adjacent to Hall Gate amid much fanfare in December 2011, but the project could not move an inch from the drawings till date. The proposal was to introduce 200 magnetic self-driven pods which were to run on 20-foot elevated guideways in the holy city. The idea was to ferry between 50,000 to 75,000 passengers daily and the network would have connected mainly the railway station, the bus stand and the Golden Temple with a tentative fare between Rs 40 and Rs 50 per seat. The system was projected to be completed by 2015 with private financing on a build-own-operate-transfer (BOOT) basis. Tejinder Kaur, chairperson of Punjab Infrastructure Regulatory Authority (PIRA), had conducted the hearing session of objections in Amritsar in February 2013 and had announced that the civil part of the project would start by June. Punjab Infrastructure Development Board (PIDB) invited fresh bids earlier last year through an advertisement dated February 22, 2013, while the last date for receiving the bids was April 26, which was later extended till May 21. The project appeared to be on track after the Punjab Infrastructure Development Board (PIDB) received an "unsolicited" proposal from ULTra Fairwood India Pvt. Ltd, a joint venture of Fairwood and UK based ULTra (Urban Light Transport) group, which has introduced magnetic pods at Heathrow Airport, but it got delayed after the heritage lovers raised objections that it would eclipse the view of the holy city's significant landmarks like the Jallianwalla Bagh and the Golden Temple. Subsequently, the government changed the route plan from the railway station to the Golden Temple. Similarly, the residents had raised queries whether the path built for the pods would leave an impact on the ventilation and sunlight in their residential buildings adjoining the route or impinge on their privacy. During his visit yesterday, the Deputy Chief Minister said the PRTS system had taken a back seat because of some technical flaws. "We have to study the company's credibility before finalising anything. Officials have been deputed to monitor this aspect and find a way out. It is a time-consuming exercise, but we are on the job to resolve the problems in implementing this project in Amritsar," he stated. The Urban Light Transport PRT (the mode chosen for Amritsar) is basically a four to six-seater driverless, battery-powered, laser-guided vehicle with a central control system known as a magnetic pod that uses rubber wheels running on an elevated guide way. It is like a personal taxi, which is demand-responsive to a commuter. Punjab has invited competitive bids for the country’s first Personal Rapid Transport system to connect key tourist spots. The driver less, battery-operated Heathrow airport pods . unjab has invited competitive bidding for the country's first Personal Rapid Transport (PRT) system in Amritsar. This would make Amritsar the second city in the world after London to have this unique transport system. The PRT uses driverless, electric-battery powered, computer-driven vehicles called "pods" which is currently operational at the Heathrow airport. ULTra-Fairwood, a UK based company had proposed the project for Amritsar, offering to operate the PRT system connecting the main attraction of the city, Golden Temple, with three parts of the city. The company is a collaboration between Ultra, that designed the innovative technology, and Fairwood which is already in discussions with the authorities in other major Asian cities which suffer from major transportation infrastructure issues like congestion, space constraints and pollution problems. 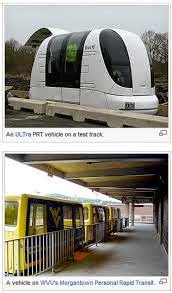 ULTra owns the Pod Car PRT technology. The Akali-BJP government just before it had gone to the elections last year had announced with much fanfare the transportation project in December 2011. Deputy Chief Minister Sukhbir Singh Badal had even laid the foundation stone for the project. The transport system in the city that comprises the highly congested old city area housing the holy shrine of the Sikhs, Golden Temple, besides the modern city developed around it, is expected to be a role model in providing volume transport in a major city environment. The border city of Punjab is also visited by tourists in large numbers to see the historic Jallianwala Bagh and the retreat ceremony at the border checkpost with Pakistan. The Golden Temple is visited by people of all faiths from around the world all around the year with as many as 50,000 people visiting on some special days. The Punjab Infrastructure Development Board (PIDB), a nodal agency set up the state government after accepting the unsolicited proposal by the UK based company had decided to go for open competitive bidding in order to encourage competition under the Swiss challenge method. The proposed project would have a route length of 3.53 km with seven stations at Ghanta Ghar market roof, multi-level parking at Galiara, Kairon Market Hall Bazar, Tikona Park, Railway Station, Jagat Jyoti School and Bus Stand. Besides ULtra-Fairwood at least two vendors, Swedish firm Vectus and US-based SkyTran are known to be interested in the project. SkyTran is test running the PRT system based on magnetic levitation at the NASA Ames Research Centre in California, USA. Vectus is currently in the process of implementing the system in Suncheon, Korea.